As the saying goes, birds of a feather flock together. But do our feathered friends also have an inside track on felonious foul play? 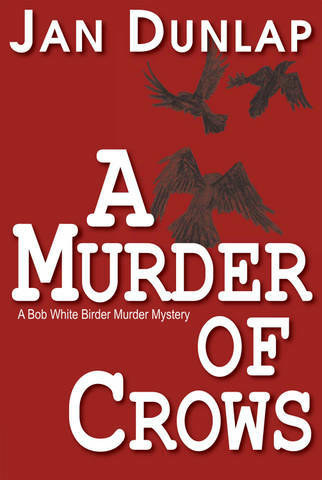 In her latest release, A Murder of Crows, Jan Dunlap’s protagonist – Birder/high school counselor Bob White – wrestles with hypnotized students, wind farm controversy, faculty secrets, and rare birds to unmask a murderer. Q: Let’s start with some background on your journey as a writer and the moment you knew that this was something you wanted to do. A: I fell in love with the idea of being an author the first time I walked into a public library. I think I was in second grade, and I was entranced by the fact that you could find a book about anything in a library. I wanted to write a book to put up on those shelves! When I was in high school, I wrote for the school newspaper, and I so enjoyed the writing that I took an English/Communications major in college, then went on to work professionally in Public Relations and advertising. I really enjoyed research and interviews, so I thought I would always be writing non-fiction, and for many years while I was raising my children, I freelanced for regional and national magazines writing about personal spirituality. I also wrote a humor column for my local paper based on raising my children. I admired Erma Bombeck so much, and her columns helped me stay sane as a mom, so I latched onto that style of writing: conversational and tongue-in-cheek. One day, I finished reading a novel, and it was so poorly written, I decided I could do at least as good a job as that author had done. I guess you could say my pride got the better of me – I had to give it a try. I discovered I really liked inventing characters and witty dialogue, so I decided I’d find a niche and see if I could land a book on a shelf somewhere. Q: Were you a fan of the mystery genre when you were growing up? If so, who are some of the authors that you admired? A: I read all the Nancy Drew books, but then lost interest in mysteries until I discovered Tony Hillerman when I was in my late 30s. I’ve always loved the Southwest, and I loved how Hillerman wove the Native American culture and the land itself into his novels. That got me hooked on mysteries. Nevada Barr has that great sense of place, too, and I always learn a lot of natural history from her books. I liked that educational component in both Hillerman’s and Barr’s writing, and I try to do that same thing in my books, but with birds and conservation. Q: How did you go about honing your writing and storytelling style? A: Writing a humor column for about five years really gave me the practice I needed to find my voice. I turned out a weekly column, and even though the columns were short, I labored over them to hit exactly the right tone. I read books by authors whose style I admired – like Janet Evanovich (her Stephanie Plum series) – and authors whose craft impressed me – like Steve Berry, David Baldacci, John Grisham – and studied how they developed plots and tension. I actually outlined entire published novels to better understand the structure of a story! Q: There are lots of subgenres of mystery writing – the P.I., the amateur sleuth, police procedurals, cozies, capers, locked rooms, noir, suspense, howdunits. What category does A Murder of Crows best fit and why did you choose it as the best vehicle for your plot? A: A Murder of Crows, like all the Birder Murders, is a cozy. When I was trying to find a niche for writing novels, I knew I wanted to write about birders solving murders, but I wanted it to be a humorous series, so the cozy subgenre seemed ideal. My books are more driven by the characters than the plot – one of my booksellers calls them ‘mystery light,’ which is exactly what I was aiming for. I want readers to have fun when they read my novels, not get stressed out! Q: So what inspired you to mix birds with murder? A: My younger son went on a birding trip when he was in high school. It was the dead of winter, and I knew he’d be in remote locations. Being the overprotective, nervous mom I was, I worried something dreadful would happen to him, and I wouldn’t be there to help. The worst thing I could imagine was an injury and freezing to death. And then I imagined something else: my son finding a dead body! I realized it would make a great mystery if birders found bodies in these remote places they go birding. Q: Are you a birdwatcher? A: I am! Most of my birdwatching takes place on my porch, though. We’re lucky enough to back up to a preserved piece of forest and marsh, so I get lots of varieties of birds passing through my yard. I’m not at all a dedicated birdwatcher like my protagonist – I have yet to drive hours in hopes of seeing a specific bird in the wild! Q: Do you have a favorite feathered focus? A: I love Bald Eagles. Every time I see one flying, I have to stop what I’m doing and just gaze at it. The grace and power of that bird is awe-inspiring for me. Q: Conservation themes are a recurring theme in your books. What kind of research goes into this? A: A great deal! I do extensive research on conservation issues to be sure I cover both pro and con sides in my novel. I do a lot of online investigating, I read books, I interview experts in the field, I watch videos. I find it all so interesting, I wish I could put more of the research into my books, but I always have to balance what is necessary to the story, and what is just interesting information. Sometimes I turn up really funny anecdotes to include. For instance, in A Murder of Crows, I was researching complaints about wind farms, and found a few stories about folks who insisted that the frequency of the turbines gave them hallucinations, so they wanted to sue the wind farms. The complaints, it turned out, were fabricated in hopes of getting financial settlements. That’s the kind of material I love to work into stories. Q: Tell us about your protagonist and the skill sets he brings to the table? A: Bob White, as an expert birder, is a skilled observer, so he notes details others might miss as he tries to solve murders or mysteries. He’s also a sensitive listener, and as a high school counselor, he’s trained to problem-solve and listen to his gut instinct when it comes to the human element. He’s also very likable and non-threatening, which often can catch his antagonists off-guard to his own benefit. Q: If your books were turned into a television series, who would play the lead? A: Tom Hiddleston has the height, the smile, and the likability. Q: How much of your books are based on real places and real people? A: A lot! I love writing about real places both to give readers a grounding in reality and because then I get to go there myself in order to capture it on the page. Many of my characters are composites of people I’ve met: my protagonist, Bob White, is partly a combination of two high school counselors I know, my son, my husband, and me. I really enjoy creating new characters, too, because I start with one very human trait and build from there. Q: Do your characters ever talk to one another – or, for that matter, to you – inside your head? A: Just a minute – let me check with them, and I’ll get back to you. (Pause) Yes, yes, they do. Q: Have they ever surprised you over the course of writing their actions and conversations? A: All the time! Here I thought that as the creator of the characters, I got to call all the shots, but being an author is like being a mom – they don’t always listen to you or do what you want them to do! I know I’m controlling too much when I find myself stuck in the progress of my plot. That’s when I realize I’ve written all of us into a corner, and I need to go back and really let the characters drive the plot, not me. Sometimes, I’ll read a piece of dialogue I’ve slaved over and then delete it all, because it’s not the character’s voice, it’s mine. Like kids, characters can be really stubborn when things don’t go their way. Q: How did you go about making the all-important decision of who would publish your work? A: It was the process of elimination. I spent almost three years querying agents to represent me to a national publisher, but no one took me on as a client. After several agents said that no one was interested in birds – even though it’s one of the fastest growing hobbies in America – I decided to try a small publisher in Minnesota since we have a very active birding community in the state. I researched regional publishers (no agent required) and found North Star Press, Inc. of St. Cloud. They focused on books with a Minnesota tie-in, and my publisher herself was a birder, so she was very enthused about the project. That was five books ago. Q: What do you know now about the publishing world that you didn’t know when you started? A: Writing is the easiest part of a writer’s task – once you’re published, you need to devote enormous amounts of time and energy to marketing your book. I wish I’d written all 12 books in my series before I’d gotten the first one published because I’m always behind now on writing! Q: What do your five children think about their mom’s mystery-writing career? A: I’m writing book #6 in the series right now. It’s titled Swift Justice and will be out in 2014. I’m also planning a trip to the Rio Grande Valley to research birds and settings for book #7. A: I love hearing from readers at my website www.jandunlap.com and often work into the books the ideas they share with me. I’m also on Facebook, Twitter and Pinterest, where I pin images and ideas for upcoming books to give readers a sneak peek into what’s ahead for Bob White. Finally, I do write a brief humor blog on my website to give visitors a weekly laugh. And my publisher does offer free Kindles of my books on occasion: the third book in the series, titled A Bobwhite Killing, is going to be free on Kindle at Amazon.com July 10-14, 2013. It’s a great opportunity to try out a Birder Murder and get to know Bob White and the world of birding!